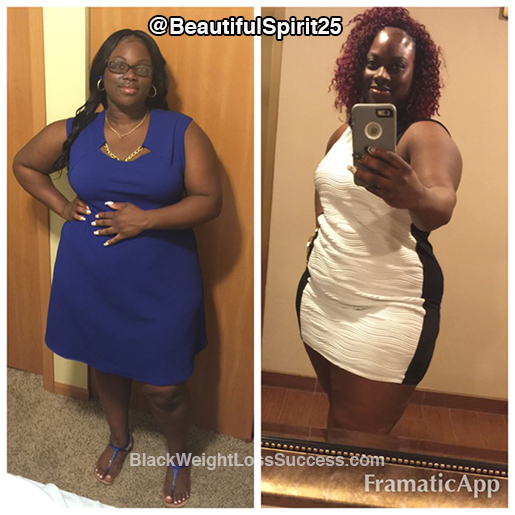 Tequilla lost 42 pounds. A dressing room wake up call caused her to consider how many pounds she’d gained due to unhealthy eating habits. A little over a year ago, she started cleaning up her eating habits and working out with at-home fitness programs. Check out her results. I went home, got on the scale and I weighed 317 pounds. Being shocked doesn’t even being to describe my initial reaction. At first, I didn’t do anything about it. Kept eating fast foods, but then one day I was like, “Let me try Shakeology again.” I told myself that I needed to get my weight under control. I lost 10 pounds in 2 weeks. 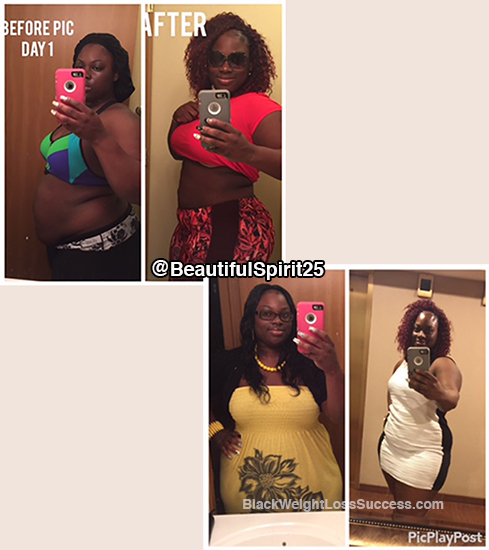 On July 27, 2015, I started working out and doing the 21 Day Fix Extreme program. It was a struggle. I struggled with eating the correct foods and finding the energy /time to be consistent with my workouts. During this year, I’ve tried Insanity max 30 (started multiple times, but completed it twice), 21 Day Fix Extreme (Completed twice), CIZE (never finished), and T25 (never finished). Since my eating habits weren’t the best, I would lose weight here and there. I was stuck in the 280’s for almost 6 months. Then, 2 months before my birthday, I told myself that I have to get to at least 275 pounds. I started the Insanity max 30 program again. I also focused on what I was eating, stopped drinking beer and stopped going out to eat all the time. I made sure I wasn’t eating after 6:30 pm and that’s when I finally started to see my best results. I was able to get out of the 280’s and reach my goal of 275 pounds 3 days before my birthday this year. I was so excited! Now, I’m 42 lbs lighter and looking forward to losing another 50 to 60 lbs. My starting weight was 317 pounds and right now I weigh 275 pounds. I’m 5’8″ tall. I haven’t been this happy with myself in a long time. Even though I am not at my goal weight, I don’t wear a body suit under my clothes anymore. I’m not ashamed of my body anymore. The only thing I can do is continue to improve me. I cook all the time now and I enjoy all the different meals I can create that are not only healthy but delicious. My “Go-to foods” when I’m really trying to focus are fish, ground turkey, grilled chicken thighs, cucumbers, tomatoes, salads with kale and/or spinach, and of course my Shakeology. Since Shakeology and Beachbody workouts are a big part of my success, I have became a Beachbody Coach. I just want to be able to help other people on their journey while I continue mine. For the past year, I have worked out almost every day. I’m not perfect, so in the beginning it was hard to get into a good routine. Like I said earlier, my eating habits were all over the place. I still had those craving for the greasy food. Now, I try to stick to eating 80 to 85% healthy. If I have a craving for something, I eat it but I won’t over indulge in it. The advice I would give others is to never stop and to trust the process. There is no quick fix to losing weight. Trust me, I’ve tried, and when I tried quick fixes I would gain all the weight back and then some. Even if you continue to eat bad or workout once a week, keep going because at the end of the day you are further than you were when you weren’t doing anything at all.